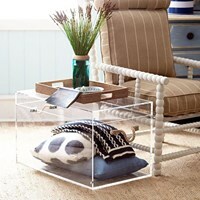 Other Living Room Furniture in the form of an acrylic table while having a function as a storage box. Become the interesting choices to add beauty to your room. Acrylic Chairs that can also be used as tables made of thick acrylic. Will add a unique style to every event or office environment or decorating your home. Made with high quality Acrylic gives a chair with a good appearance. Family Room Furniture in the form of acrylic wall shelves. High transparency acrylic material has strong corrosion resistance. Designed for easy maintenance and the convenience of everyday use. Excellent durability, environmentally friendly and easy to clean. Suitable for residential and commercial spaces, available in various sizes and shapes. Contact us for ordering information and other attractive offers. The Living Room Acrylic Table can be used as a decoration in your room with a modern design made of high quality Acrylic. 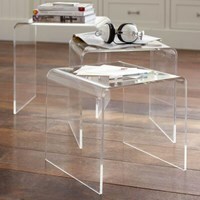 This Acrylic table is suitable for you lovers of minimalist furniture, simple but still looks elegant. Buat Permintaan Untuk "Acrylic Furniture"